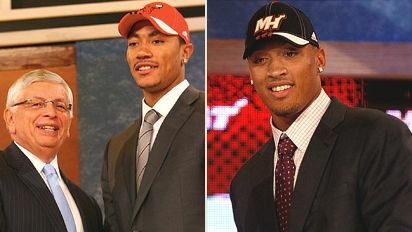 Rose and Beasley were two of the record seven freshmen lottery picks. With an unprecedented 11 freshmen picked in the 2008 NBA Draft, Antonio Williams breaks down how these talented players will impact their new NBA teams. Eric Gordon and Jerryd Bayless endured drama swirling around their programs for most of last season. But both played well enough to warrant top-10 billing in the NBA draft, writes Andy Katz. As you study all the NBA mock drafts, remember this: There will be some flameouts. Derrick Rose cares so much about winning that he'll tear up after a loss, even those ridiculous AAU summer games. It's that competitiveness that will make him a special player in the NBA, John Calipari says. Chad Ford takes a look at the process many teams use to classify draft prospects -- the tier system. Ford: Who's in, who's out of the 2008 NBA draft? Here's the official list of the early-entry candidates who are in and out of the 2008 NBA draft. How athletic are the top prospects in the draft? Chad Ford has their test results. Where: Madison Square Garden, N.Y. Listen to Chad Ford's most recent 2008 NBA draft podcasts. • 6/19: David Thorpe, Scouts Inc. Which NBA prospect would be a good fit on your team? Wanna talk 2008 NBA draft? Join the conversation. Greg Oden and Kevin Durant went 1-2 in what could go down as one of the best drafts ever. Italy's Andrea Bargnani became the first European to be selected with the No. 1 pick.